Beer and gaming have always gone together, from shove ha’penny to darts and pool, games and booze have lived hand in hand throughout history. However, in Every Round Counts, instead of drinking the beer the game is all about serving the beer and being the best damn beer server in the bar. 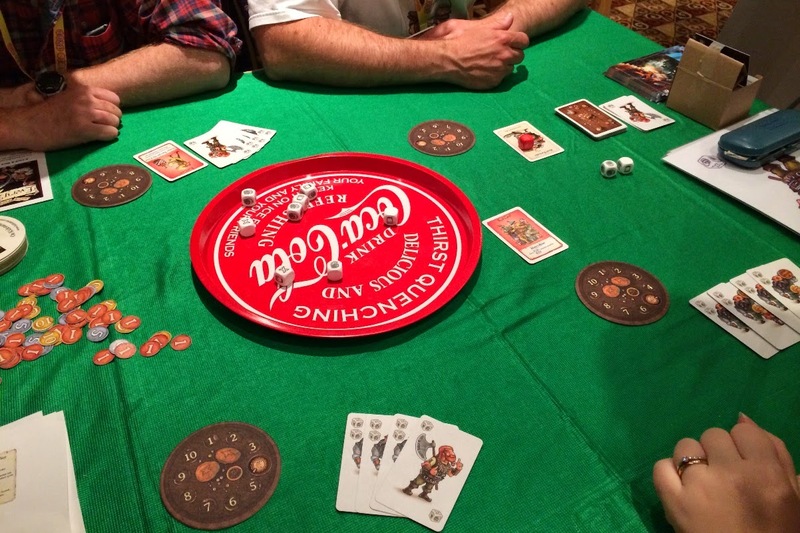 Every Round Counts is a dice rolling gambling game by Thirsty Knight Games, currently raising funds on Kickstarter. You play a bartender in your typical fantasy tavern and the heroes have returned from a busy day of orc killing and dragon slaying and are celebrating their mighty haul by drinking, lots. The aim of the game is to be the best bartender by serving the most drinks to the thirsty heroes. You’re first dealt a hand of card representing the various patrons of the bar as well as some potential events. The majority of the cards show how many customers you might serve, dictating the number of dice you’ll be throwing for the round and theoretically the maximum number of drinks you can serve. There are also some effect cards split into red and yellow types. Then you select, or bet, how many drinks you’ll attempt to serve. Betting is the important part of the game, because the size of your bet is your maximum potential score for the round. Score more beers than you bet and you only get to score the bet size. Score less beers than you bet and you just get the score for only those beers. So why not just put a big bet on? Because if you manage to hit your bet exactly, you get a nice juicy tip from the customers, scoring you a bonus. Once you’ve made your bet it’s time to roll the dice to see how many drinks you get to serve. But that’s not before your opponents attempt to scupper your plans. 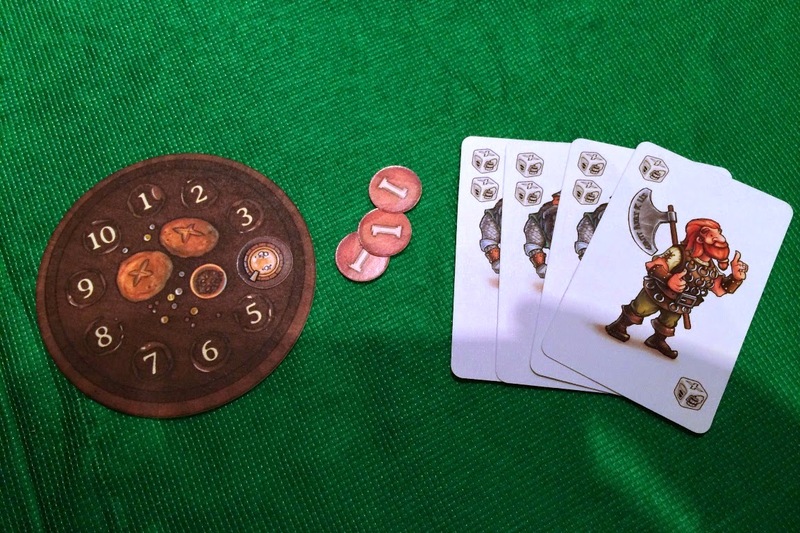 There are two sets of cards that can be played on opponents and yourself, yellow get played before the betting and red after, these could give you a re-roll, alter the number of dice you roll or allow you to serve shots, another face on the dice increasing the potential number of drinks served. The nice thing about these cards is that although they add an element of randomness that and can change your odds, they never drastically alter the results. The cards are very well balanced and even with a handful being played on you; you usually still have the chance to make your bet. 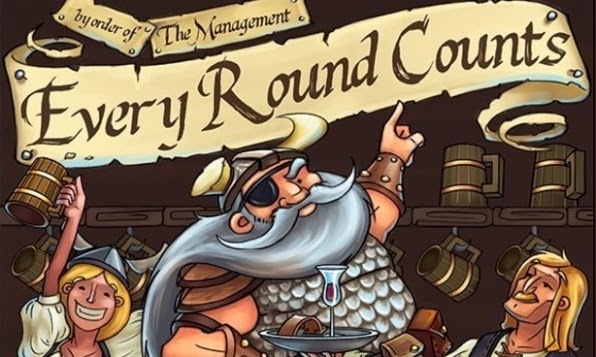 Every Round Counts is a really good blend of theme and mechanics, everything fits together nicely, its gambling, drinking and dice all at the same time. Thematically it all makes sense, taking order, grabbing your tray of beers and making your way through a crowded bar while your fellow bar staff attempt to trip you up. The betting aspect really sets it apart, since you’re not just beholden to the luck of the dice but trying to guess the dice roll. There version I played at the UK Games Expo was a prototype but the artwork was whimsically appropriate and the dice rather nice. The really neat thing is that the score cards are actually beer mats. The only thing missing was a branded serving tray to roll the dice into. Every Round Counts is a great little dice game; quick to learn, quick to play and balances the randomness of the dice rolling with the decision of choosing your bet. I suggest you check it out on Kickstarter.